Girls from impoverished families view themselves as powerless and without life options. 40% of the region's primary-aged schoolgirls do not finish grade 8. Adolescent girls miss nearly a week of school each month due to lack of sanitary supplies. The absence of girls’ health and AIDS-prevention education contributes to 25% HIV/AIDS prevalence among Kendu Bay girls, compared to the national average of 6%. To promote gender equity and mitigate the causes of girls' absenteeism, poor performance and school dropout, KSHP conducts an integrated program supporting girls' social empowerment and health education in 23 Kendu Bay primary schools. Program-supervised Girls' Clubs are a vehicle for instruction and life skills development. 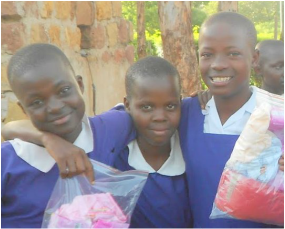 Over 2,000 adolescent girls in partner schools receive 'Dignity Kits' containing underwear and locally-made reusable sanitary supplies. Construction of gender-sensitive latrines at partner schools ensures girls have secure, private facilities. ​Girls' school retention reaches 100%. High school eligibility improved from 43% to 100%. Girls hold position #1 in 75% of all grade 1-8 classes. WE HAVE DISCOVERED that integrating a menstrual health management and life skills curriculum, Dignity Kit supplies and gender-sensitive latrines - with availability of high school scholarships - exponentially reinforces a program dedicated to girls' empowerment and school retention. "When I was in Standard 6, only one girl was in the top ten of our class. Then KSHP trained us and made us confident. This year in Standard 8, girls lead the boys. Out of the top ten students, eight are girls! 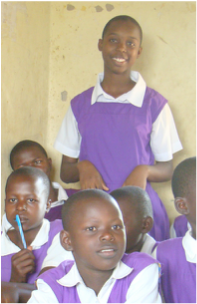 Four girls are in the top five at my school today," boasted Rose Auma, Alego Primary School. KSHP is a registered 501(c)(3) non-profit charity. Girls in this economically-depressed region lack opportunity to learn their potential and develop essential life skills. The absence of fact-based health/gender education places them at high risk for pregnancy, early marriage and HIV-infection. ​To improve girls' self-confidence, health awareness and decision-making, KSHP promotes an integrated learning and skills-building program that benefits more than 3,500 girls. Trained teacher mentors conduct weekly meetings on topics relevant to girls' health, AIDS-prevention education and life skills development. A KSHP-produced Girl Child Manual gives teachers resources for guided discussion to help girls improve critical thinking and boost self-esteem. Girls apply their learning through inter-school club debates. These competitions with neighboring schools help girls develop their language and leadership skills. Girls Club debates have become 'bigger than football' in Kendu Bay, earning prestige for the school and recognition for the girls who participate. Weekly after-school meetings give girls in grades 4-8 opportunity to learn and share in a framework of trust and support. Topics discussed in term one recur as subjects of inter-school debates in term two. The popularity of Girls Club debates has elevated its preparation to a school wide event in which boys take an active coaching role. From the hundreds of girls who participate in Girls Club debates, the grand prize of a 'Complete Makeover' of new school uniform, socks and shoes awaits twelve winning debaters. "What you people at KSHP are doing for our girls is the best thing that has ever happened in our schools," noted one head teacher. "These girls grow up being told, 'You can never amount to anything,' But you came in with Girl Child Club education and helped them learn to VALUE THEMSELVES. Girls' self-confidence has grown so much! These activities make them realize they have potential." "Not a single girl wants to miss this meeting! In fact, one week KSHP was late to arrive, so our teachers sent us home. But we hid in the bushes to wait. When we saw the vehicle, we rushed out to meet Date so we could have our meeting. I can tell you, our behavior has changed. We counsel our sisters to stay in school and to never give up." Lack of sanitary supplies causes adolescent girls to miss nearly a week of school each month. Unable to keep up in class work and discouraged by poor performance, girls drop out of school, become pregnant or opt for early marriage. HIV/AIDS prevalence among girls in this region is 25%, compared to the national average of 6%. To reduce absenteeism caused by girls' monthly menses, ​KSHP distributes 'Dignity Kits' to over 2,000 girls in 23 partner schools each year. Kits contain underwear, locally-made reusable sanitary supplies and emergency disposable pads. KSHP partners with a group of local widows who make our reusable sanitary napkins. Local production helps keep costs low and returns a small stipend to the widows. In 2009, 125 girls at six partner schools received our first distribution of Dignity Kits. This year, the VOTY (Voice Of The Youth) women's cooperative assembled over 21,000 reusable pads for KSHP. These pads enable more than 2,000 girls to stay in school during their menses so they can maintain their studies. Dignity Kit distributions serve as school and community education events to raise awareness and improve understanding around girl child issues. "We are so happy," exclaimed a schoolgirl. "I feel very confident now and am not afraid to go out from my house. Now that I have innerwear, the pads won't fall down." "Dignity Kits give girls who most need an education a way to stay in school," notes Alidade Mboya, KSHP Kenya project manager. 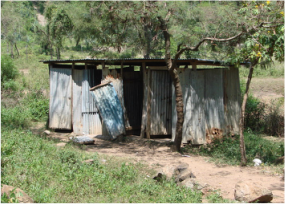 Lack of privacy from poor latrine facilities discourages girls' school attendance during their menses. Shared facilities and broken doors fail to protect girls' privacy. To avoid humiliation, adolescent girls stay home during their menstrual periods, missing up to one week of school per month. To improve girls' hygiene and sanitary conditions, ​KSHP works with local school communities to construct gender-sensitive latrines at 23 partner schools. Absenteeism dropped up to 70%. Over 5,700 school girls benefit from improved sanitary conditions. Access to secure and private latrines improves girls' school attendance and health and promotes self-esteem. School communities seeking project benefits submit application and a signed Partnership Agreement to contribute their share of funds, labor and/or materials. ​supported in part by a generous grant from Dining for Women, a non-profit giving circle dedicated to empowering women and girls living in extreme poverty. KSHP collaborates with Voice of the Youth (VOTY) women's co-operative for the production of reusable sanitary supplies.